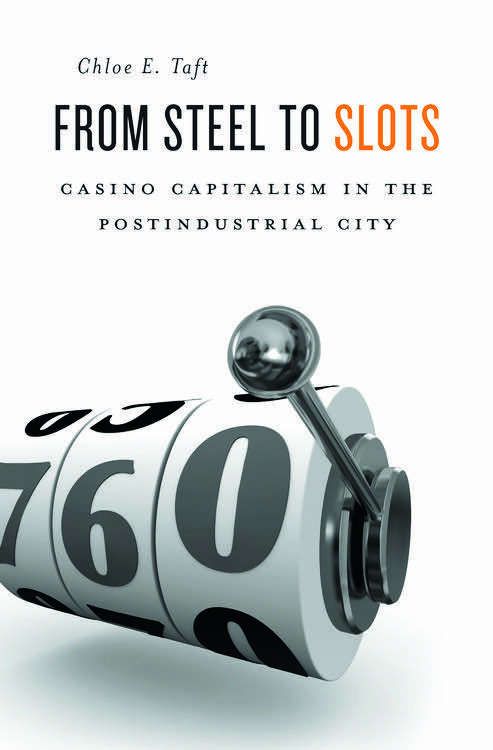 From From Steel to Slots: Casino Capitalism in the Postindustrial City by Chloe Taft. Copyright ©2016 by the President and Fellows of Harvard College. Used by permission. All rights reserved. Names in this story have been changed. For more on the book see the Harvard University Press website. In August 2005, just off Bethlehem’s historic Main Street, two costumed gondoliers “with authentic Italian accents” set up a tent at the annual, vaguely German-themed, Musikfest outdoor concert festival. 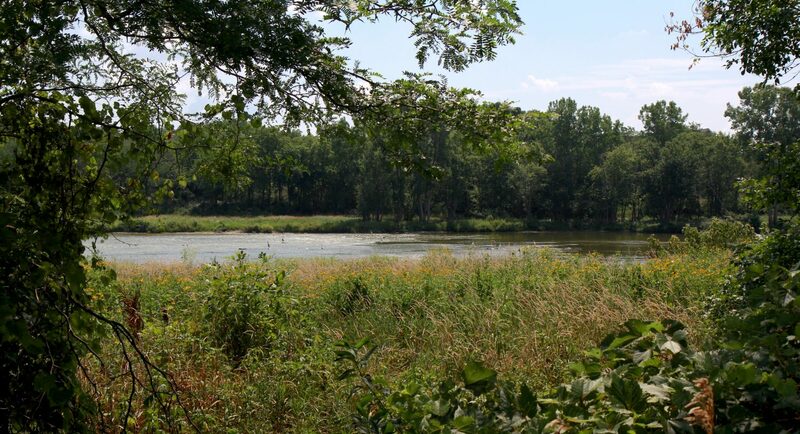 From their landing amid the eighteenth-century Moravian stone buildings, they serenaded thousands of visitors with a pitch to win local support for a proposed multimillion-dollar casino complex a couple miles across town. The gondoliers were representatives of the Las Vegas Sands Corp., the largest real-estate developer and casino operator in the world and a first-time $50,000 Musikfest sponsor. 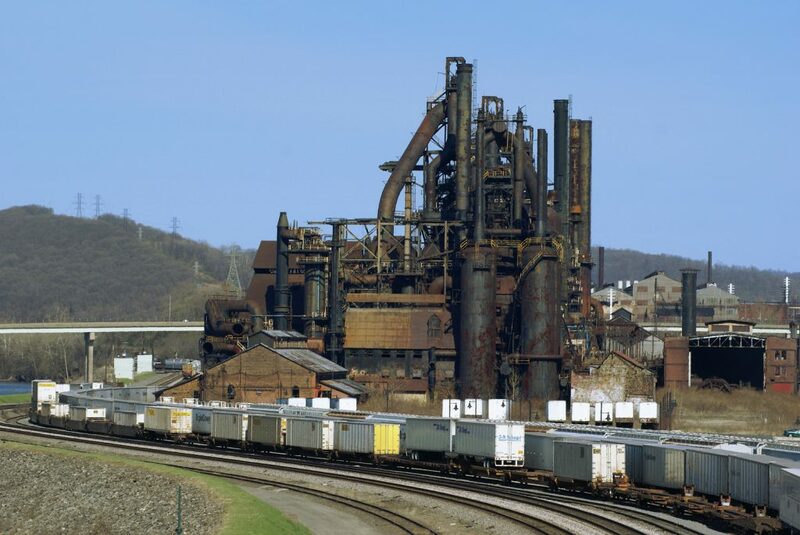 The company, having seen an opportunity to enter the newest U.S. gambling market when Pennsylvania legalized casinos the previous year, had zeroed in on the economic potential of the Bethlehem Steel Corporation’s former namesake plant which had been vacant for almost a decade. The gondoliers reflected Sands’ most recognizable brand, The Venetian, the famous casino resort in Las Vegas. Epitomizing the casino business model of themed luxury and escape, aesthetically and temporally distancing visitors from their everyday surroundings, The Venetian had opened in 1999 with an orchestration of white doves, trumpets, and, of course, singing gondoliers. Italian actress Sophia Loren christened one of the motorized gondolas that float down the resort’s interior Grand Canal. Beneath a painted ceiling of blue skies and fluffy clouds, visitors pass under a replica Rialto Bridge, through St. Mark’s Square, and past the Doge’s Palace. In 2007 the corporation would replicate this highly successful model and open a second, much bigger Venetian across the Pacific in Macau, again with gondoliers, Italian landmarks, and a canal three times the length of the one in Vegas. The deep symbolism of beginning new construction in 2007 on the defunct Steel site, which sat silent for nearly a decade, was not lost on Las Vegas Sands or its public relations outfit. At the last hearing for the casino license in Harrisburg, a gaming commissioner asked Bill Weidner, the president of Las Vegas Sands at the time, whether his company planned to use American steel for the project. “Is there any left?” Weidner responded to laughs from the panel. Yet in the end, Sands publicly committed to using only domestic steel in its Phase One construction, a good portion of which came from Nucor, where steel from the Bethlehem plant was shipped for recycling after it closed. 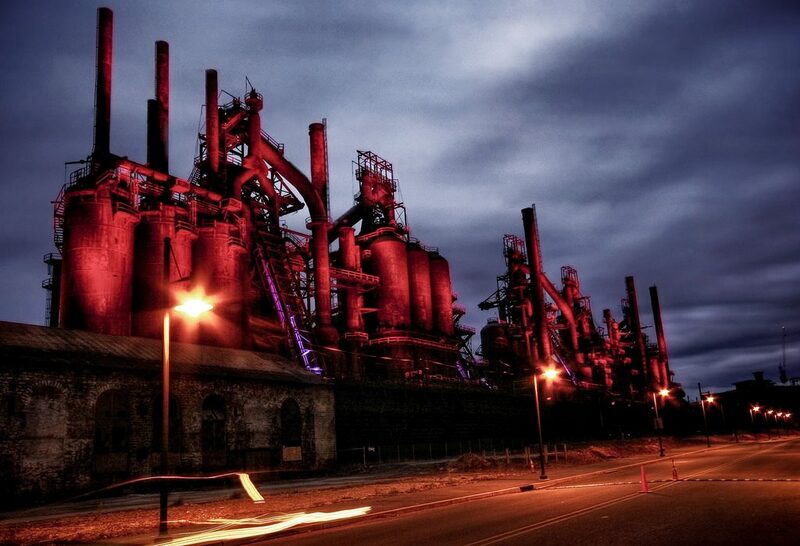 The historical and emotional importance of Bethlehem Steel argues against a Disney-esque interpretation. The design of the casino, hotel, and retail center combines gabled roofs, exposed steel structure, brick, and glass in ways that are compatible with the existing buildings and infuse the project with new energy and excitement now absent from the site. Coordinated dramatic lighting effects in the new building and existing ones will light the site with a glow that will recall the glowing furnaces of the plant circa-1942. As Weidner explained, “It will be an extraordinarily emotional connection that then can create an added value.” But the public debate over Bethlehem’s community identity made clear that Sands’ decision to link the casino design to the steel mill specifically “circa-1942” is a vision of the Steel’s legacy and emotional resonance that can be disputed. Sands’ conception attempts to usher in a new era of consumer energy divorced from the recent decline of the plant and the feelings of anger and betrayal many Bethlehem residents continue to feel as a result. It grasps for a more distant and favorable nostalgia by focusing instead on the pinnacle of the Steel’s wartime production and advancements for union workers. The design overtly taps the pride with which locals reference the company that “built and defended America,” helping to win a “good war” that Americans more often celebrate than interrogate. Although the casino architecture is an amalgamation of industrial elements in the surrounding Steel buildings — it incorporates saw-tooth roofs, steel columns with brick and glass infill, corrugated metal sheathing, and crossed steel trusses — much of the original function of these elements is erased. As the director of design at Las Vegas Sands noted, they were careful “to make sure it doesn’t look too large or too bulky.” Instead, tower-like structures on the casino and hotel are meant to mimic the smokestack skyline of the steel factory, with the fire in the furnaces and the glow of the steel replaced by electric lights. There are other major differences. Many original Steel buildings are typical of the “daylight factory” style in their use of monitor roofs and lots of windows to let natural light into the workspaces. Though industrial buildings in the early twentieth century often used translucent glass in their windows to soften the glare and better diffuse natural light, some factories placed clear glass in the panes at eye-level to avoid a “prison-like effect.” The interior of the new casino, by comparison, entraps visitors and shuts them off from the outside world quite effectively. Like other casinos, there are no windows or clocks on the walls inside the Sands Casino. Owners hope these design strategies will cause customers to lose track of time and prolong their gambling. Indeed, although some monitor windows line the high ceiling of the main casino floor, the lighting at the Sands is distinctly unnatural, as one might expect in a space packed with 3,000 neon-flashing slot machines. 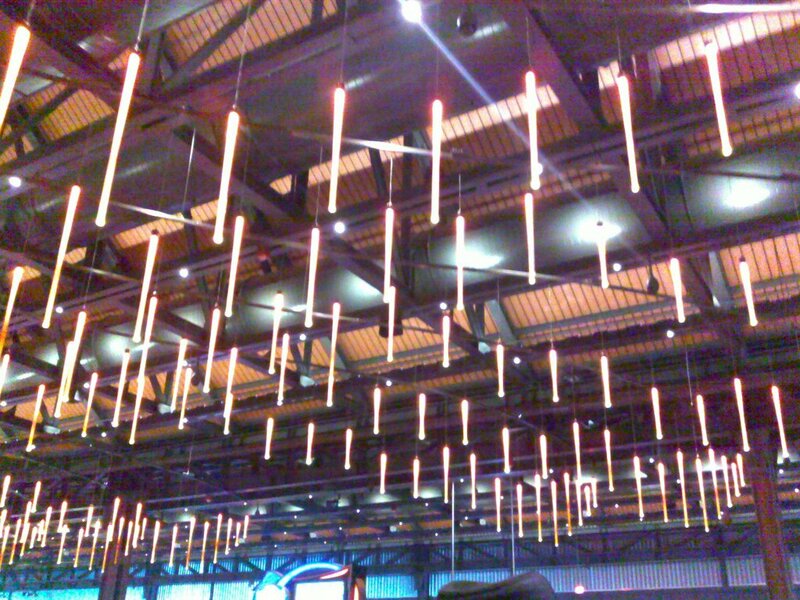 Overhead, amid exposed beams and ventilation systems, orange rod light fixtures are meant to evoke the glow of molten steel. The windowless design elements, as well as the flat roofs on the parking garage and adjacent retail space, share more similarities with warehouse-style factories typical in America since the 1960s than they do with the Bethlehem Steel of 1942 that the Sands architects referenced in their promotional materials. 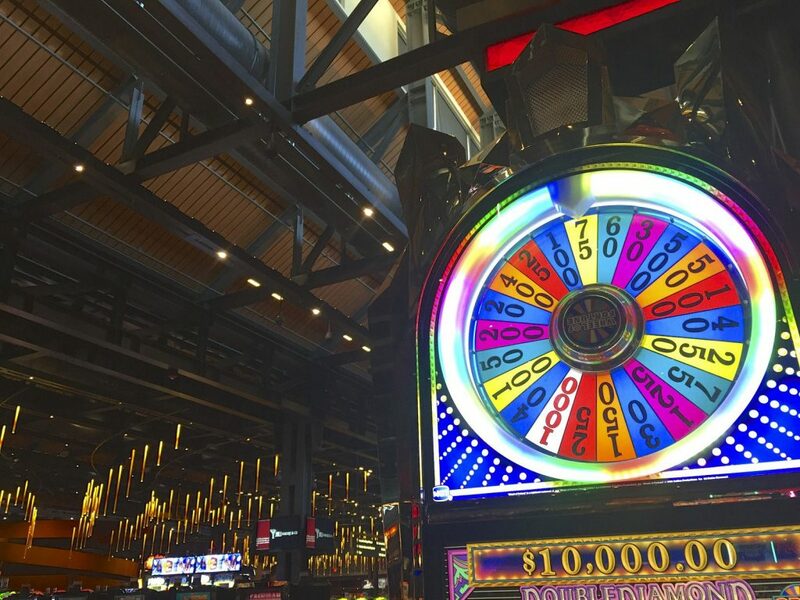 Despite some disjuncture between the new construction and the old Bethlehem Steel buildings — both conceptually and materially — the Sands casino complex incorporates two elements original to the site in dramatic fashion to blend past, present, and future. In addition to lighting the four blast furnaces on the river near the center of the development site, the hallmark of the casino structure itself is the massive ore bridge that spans the entrance to the parking garage. The twenty-ton bridge, now emblazoned with the red Sands branding, is a reminder that the casino was constructed on the Steel’s ore yard. As Sands described, “Visitors to the casino will drive under this huge structure and know that they have arrived at a unique destination that combines entertainment, energy, theatrics, and American history.” Just as Sands created an “industrial” space in the casino that simultaneously references and denies visitors access to the authentic industrial context outside, the postindustrial picturesque that the ore bridge represents cloaks industrial history with a new consumer-driven and entertainment-based economic model. 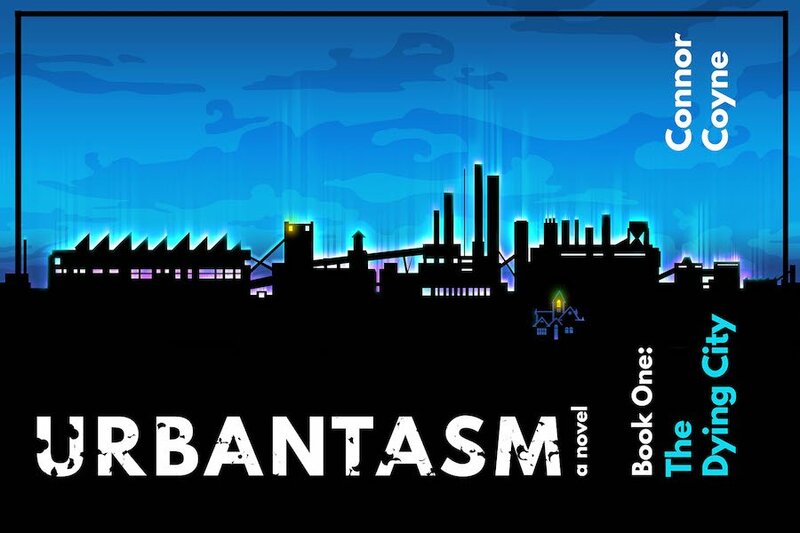 For a corporation that relies on to-the-minute calculations of shareholder value and customers who dream of future wins regardless of how much money they have already lost, the references to Steel heritage create a bridge, both figurative and literal, to help morally legitimate a postindustrial form of capitalism that in every other sense operates to render the past obsolete. From a marketing perspective, one might expect that the casino’s theme would be designed to appeal to the tourists who come to gamble, shop, and eat at the property. As architects Robert Venturi, Denise Scott Brown, and their colleagues famously said of the Las Vegas Strip, the buildings themselves act as giant signs announcing the entertainment within. Marketing specialists typically select motifs like that of the Sands’ Venetian casino resort to transport visitors to an exotic locale, apart from the reality outside. In a way, Sands’ circa-1942 industrial theme fulfills a different, and today equally exotic, fantasy — one of stable employment in American manufacturing. Area residents quickly taught me that Bethlehem’s casino design is less straightforward than simple consumer marketing, however. Some visitors to the casino, including former steelworkers, remark on the cleverness of the Sands’ orange lighting, the false interior steel support pillars, and some of the Steel blueprints that hang as art on the walls. Some even mistakenly believe that the new structure is a rehabilitated factory building. But many find the industrial experience underwhelming. The high ceilings may give the space an appropriate-to-theme machine shop atmosphere, but some gamblers complain about the noise and cavernous feeling of the space. 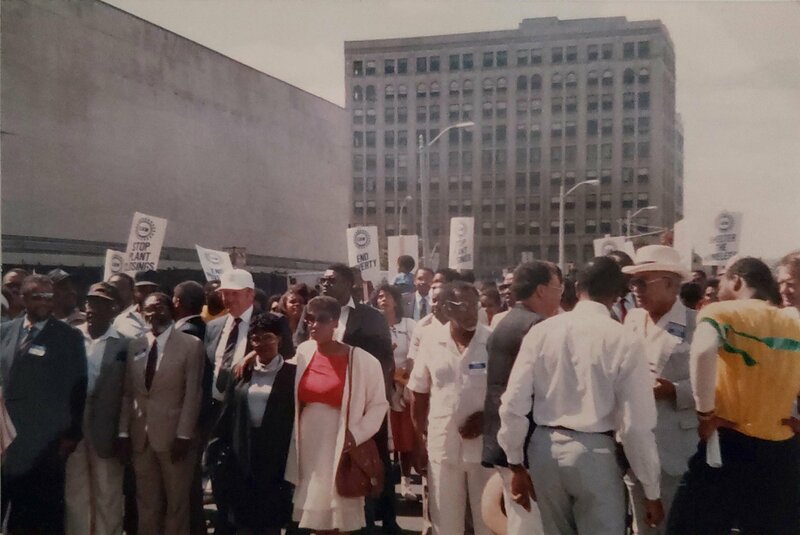 Others suggest that Sands has not gone far enough to highlight the site’s history by displaying Steel artifacts and memorabilia that local steelworker groups have offered to loan. JB: When you walk into a steel mill, there’s a lot of dirt. I mean a lot. Smoke, noise, a lot of movement, machinery. Caution signs everywhere. Earplugs everywhere for you to grab. A lot of heat. A lot of sharp objects. Sometimes fires. That’s just from my experience in the little time I worked there. I helped put out a fire three times when I worked there. CT: Whereas, if you walk into the casino, what’s missing? JB: There’s no machinery. I mean, like if they had a fake crane on the ceiling maybe, or a tow motor, a boom truck, something like that. It’d make it seem more like it. Maybe coils of steel just laying on the side. There’s a lot of product laying around in a steel mill. You see a lot of steel, just raw steel. CT: Do you think they could do that here? JB: Oh yeah they could! You would notice the theme then. Because, to tell you the truth, I don’t think half the people that walk in even know that there’s a theme to it. Chloe E. Taft is a Mellon Postdoctoral Associate in the Integrated Humanities in the American Studies Program at Yale University. Banner photo by Robert Stern. Belt is a reader-supported publication — become a member, renew your membership, or purchase a book from our store.